I WANT A FISHING SANTA!!!! Too cute! I love Santa's! That is just too cute! He would look great on my mantle! 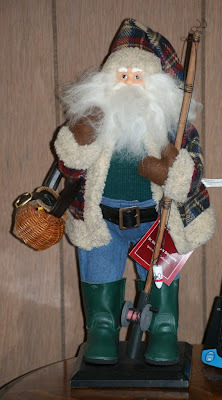 LOL.. we have a fishing Santa ! I gave it to my dad a few years back. Oh Lordy...J would flip for this Santa!! Oh, this Santa's hilarious. I love it! Miles to go before he sleeps! Misty: I have a fishing Santa also. Santa on vacation is adorable!